Mark Kurlansky writes about the basics of life. Topics have included salt, cod fish, frozen food, music, and baseball (Hank Greenberg). Detailed, comprehensive, and thoroughly researched, his latest is a history of paper and proves once again that no one is his equal in bringing the often unremarkable and unseen to vivid life. 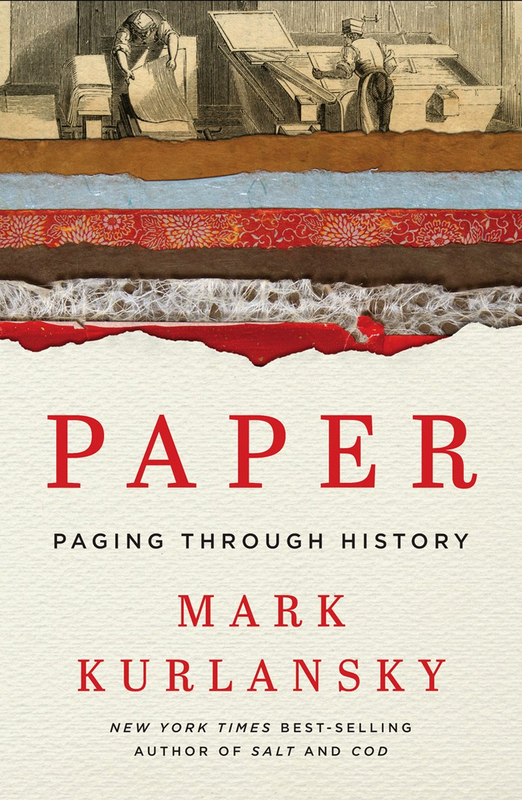 Rather than a linear march through history, Paper is a peripatetic journey across time and continents that best illustrates how paper evolved across a wide spectrum of cultures and the various reasons that led to its development. Paper, in Kurlansky’s assessment, is one step on a continuum from the origin of speech through printing to microchips to… That is, the unknown that comes next. A most useful timeline captures this development. The key theme is the role of technological change that yields a practical application of knowledge. For example, a need as simple and complicated as keeping track of commercial accounts leads to a new technology and increases one’s choices. Mankind’s move from nomadic hunters to stationary farmers led to an early form of commerce and a desire to maintain some records. As early as 3300 BCE, the Sumerians were scratching records into clay tablets. 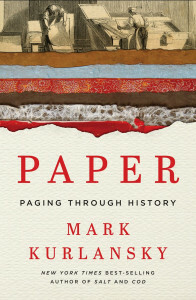 This is a history of “paper” in its broadest sense, which includes those clay tablets, notched sticks, and sheepskins. Most histories of paper have been Euro-centric, but Kurlansky provides a full range of information as he wanders through Asia, the Middle East, the Americas, and Europe. Chapters include the Islamic Birth of Literacy, Tenochtitlán and the Blue-Eyed Devil, and Papering Independence, an essay on the value of paper to the American Revolution. If it exists, or so it seems, someone has used it to make paper. Raw materials have included hemp, bark, straw, wasp nests, vines, moss, cabbage stalks, pine cones, asbestos, thistles, turf, corn husks, potatoes, old shingles, reeds, and the leaves of horse chestnut, walnut, tulip, and linden trees, not to mention rags, trees, flax, and cotton. Once made, paper has a myriad of uses, including boxes, letters, paper balloons, kites, money, paper clothes, labels, greeting cards, copy and drawing paper, bullet and food wrappers, artificial flooring, stamps—even books! The need for paper brought great progress, but it also created problems. It gobbles forests but that led to the development of tree farming on a massive scale and the use of eucalyptus and acacia trees in Brazil and Indonesia, respectively. Paper production creates pollution in the form of toxic water. And those of us who have lived near a paper mill know that the smell is an abomination. Even in 13th Century Italy, mills were forced to move because they were so loud and foul smelling. An enormous amount of energy is required to produce paper in the first instance, and recycling paper requires extra energy to produce good paper. The story of paper then is the story of writing, technological development, and the need to disseminate and remember knowledge. Plato said that writing was an “artificial memory” that would cause us to forget. Perhaps so, but would we still know Plato and a host of others if someone had not written their words onto a piece of paper?